A Kilt does not fit like trousers or a fashion skirt. 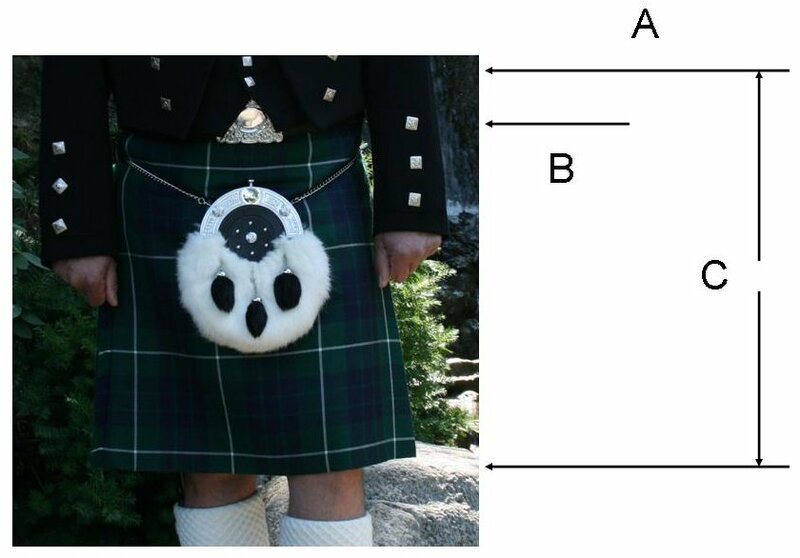 The top of the Kilt should be just above your navel. Although the bottom of the Kilt is a matter of personal preference, tradition dictates that it be worn just above the knee. Many find that a little high and prefer to split the knee cap by adding an inch or so. However, be cautious as the longer the Kilt, the sloppier the appearance. Kilt makers often ask you to take a measurement from the top of the hip to wherever at your knee, and then they add a “2 inch rise”. Just be aware of what your Kilt maker wants in terms of the length measurement, and specify either “Total Kilt Length” or “Hip to Knee”. Taking good measurements cannot be over emphasized. Measurement A _____________ Natural Waist , over shirt, midway between bottom of rib cage and the top of the hip bone, just above the naval. Measurement should be snug, but not tight. Measurement B _____________ Seat at broadest area, taken loosely over trousers, with empty pockets. The best way to take this measurement is to kneel upright (don’t bend over) on the floor, and measure from just above the naval to 1 inch above the floor. This should place it at the knee. If you prefer to wear your kilt a little longer, than consider this while taking your measurements. Be sure to have someone take this (and other) measurements for you as bending over with a tape measure will hamper a proper measurement.